Whether your involved in the fashion industry or not, it is impossible to deny that Coco Chanel is the biggest turning point in the fashion industry. Born in 1883, she grew up during a time of war. She lost her mother at a young age to cancer. Albeit her rough childhood, Chanel created something elegant from something tragic, like a phoenix from the ashes. She changed fashion forever. However, her upper hand wasn’t her creativity or her impeccable business tactics, but it was her ability to spot change before anyone else knew they needed it. A majority of her work wasn’t original or new, it was simply men’s fashion adapted to fit a woman’s needs. 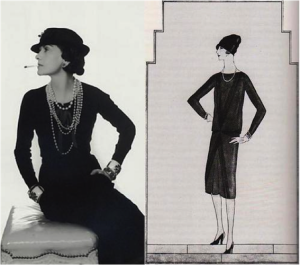 When Chanel moved to France with the love her life, Boy Capel, she noticed how fussy and uptight woman’s fashion was. She made it her mission to relieve this and make woman’s fashion modern, comfy, and find luxury in simplicity. As a woman during a time of war where men held the dominant role, Chanel couldn’t simply change fashion at the snap of her fingers. She built up her fashion career from the bottom up, starting with a little millinery in France in 1910. While she sold all sorts of hats, she was also designing. She based her designs off her husbands closet, adding and taking things away to make woman’s fashion just as comfortable as men’s, but still gorgeous. This was an insidious war with the fashion industry because Chanel knew that the men leading the fashion industry at the time would not be accepting of her ideas. Her hard work paid off when she opened a boutique in 1913 selling her own products. Sadly, her splurge joy didn’t last long. Capel died in a car crash in 1919, along with Chanel’s happiness. Her world went from color to black and white. She grieved along with the rest of the women who lost husbands and sons to the war. During this time, some would say that there wasn’t one family that was complete. Women would be seen on the streets draped in black shapeless dresses, mourning their losses. This is when Chanel realized, the other love in her life: fashion. Through her grief and loss, came what we still flaunt to this day, the little black dress. Chanel wanted to empower women, to remember the many lives lost in the war, while still looking elegant themselves. 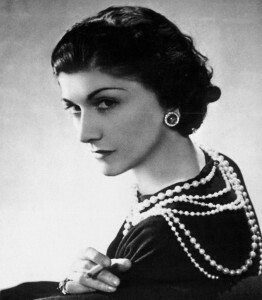 Coco Chanel is my inspiration, as a fashion designer, as a businesswoman, and as a person. She encourages me to believe in and pursue my passion for fashion designing. she doesn’t let obstacles get in her way, when she has a set goal, she will go through anything to achieve it. She believes that the only way for women to get fashion that is comfortable and elegant is for women to design it themselves, rather than letting only men control the fashion industry. I agree with her all of these insights and I am fascinated by the realm of fashion and how Coco Chanel changed fashion to this day. All this aside, I will have to work through barriers to really understand who she was. The main barrier is that Coco Chanel went through multiple tragedies in her life; losing her mom, getting put in an orphanage and losing her husband were all big parts of her personality. I personally haven’t gone through anything like that so that will be one of the big barriers. Another thing is the setting, Chanel grew up in Europe during the wars while I live in North America during a time of relative peace. Albeit these barriers, I am still very excited to look more into Coco Chanel and explore her eminence and how exactly she revolutionized fashion. All the research I’ve done up to now have mostly been around who Coco Chanel is and her life; my next steps will be looking into what shes created, how her fashion line has changed over time and her current stance in media as of today. With all this said, I can’t wait for another great Night of the Notables!